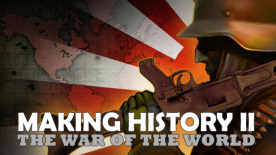 MAKING HISTORY II: The War of the World gives players the power to take full control of your nation, their colonies, regions, cities, and military units during the time leading up to and during the Second World War. Transform your cities into centers of industry and technology by developing production and research facilities. At the region level, build large-scale defensive structures such as radar facilities and fortifications, develop transportation networks, and expand the resource production needed to fuel your economy. Supplying your industries with these vital resources is necessary to run the economy and maintain domestic stability. No two games of MHII will be the same. There are an unlimited number of ways to achieve your goals and alter the course of history. Play any nation in the era of World War II on a map with over 1000 land & sea regions. Hundreds of unique land, sea, & air units representing both major & minor powers of the era . Intelligent AI instigates, reacts and adapts to the changing game dynamics generating action on the homefront and abroad. Research an array of weapon systems & tactical improvements; repair, reinforce and upgrade your military forces. Fly air missions against industrial & military targets. Construct weapons factories, shipyards, research labs & a variety of other buildings that add specific abilities to your cities & regions. Initiate infrastructure projects that modernize your nation & expand your economic potential. Manage your colonies, liberate new nations, establish puppet states or annex their territory. Region populations are represented by culture, ethnicity, religion & ideology; divisions that destabilize nations, provoke revolts, encourage reactionary coups and civil war. Engage in espionage, fund counter government groups and interfere in the internal affairs of your neighbors. Realistic economic system covering production, resources, consumption, trade, debt & inflation. A blend of strategic & tactical military game play that includes logistics, reinforcements, supply and unit specific properties. Streamlined UI interface to simplify the details of a deep game. Continuously improved and refined since its initial release.